Two more BTD foot knights painted up as Sir Richard Pembridge, and Sir Walter Paveley. Both of these knights fought at Crecy and Poitiers; Sir Richard also fought at Sluys. Both were members of the Knights Garters as well. Interestingly they als both died in 1375, after long and distinguished careers. Sir Richard is wearing the helm that is still preserved to this day in the National Museum of Scotland. The actual helm itself is one of only four surviving from the 14th C. It was acquired by a Scottish painter and collector of antiquities and arts in the late-19th C.
Besides the martial prowess of these knights, I also wanted to include them because of their blue (azure in heraldic terminology) coats of arms, to offset the many red (gules) colored arms of the others in the retinue. Incidentally, the blues are a bit darker than in the images due to the flash from the camera. Plus the arms of Sir Richard are simple yet very colorful and striking. Very nice on the gaming table. Just two more foot knights and the two units of six MAA will be ready to join the mounted MAA unit already in the retinue. Two more BTD Early-HYW foot knights - painted up as Thomas Beauchamp, 3rd Earl of Warwick, and John de Vere, 7th Earl of Oxford. The two earls were both long-serving senior commanders for Edward III and the Prince of Wales. They both participated in the Scottish campaigns, and held important commands at Crecy and Poitiers. Upon landing in France in 1346, the Earl of Warwick is said to have attacked 100 Normans with only one squire and six archers, and killed 60 of the enemy. At Crecy, both earls were fighting in the Prince of Wales' vanguard division. At the Battle of Poitiers, the Earl of Oxford was responsible for the destruction of one of the French cavalry charges. Interestingly the Earl of Oxford, for all his tireless and exceptional service, was never made a Knight of Garter. He was killed during the Siege of Rheims in 1360. The Earl of Warwick died in 1369 while on campaign in France presumably due to illness, although some speculate he may have been poisoned by his rival, Humphrey de Bohun. Here are two more BTD foot knights - painted up as Sir Reginald Cobham and Sir Ralph Stafford. Their simple, and similar, coats of arms belie their fame on the battlefield. Both were long-serving and reliable commanders for Edward III and the Prince of Wales. 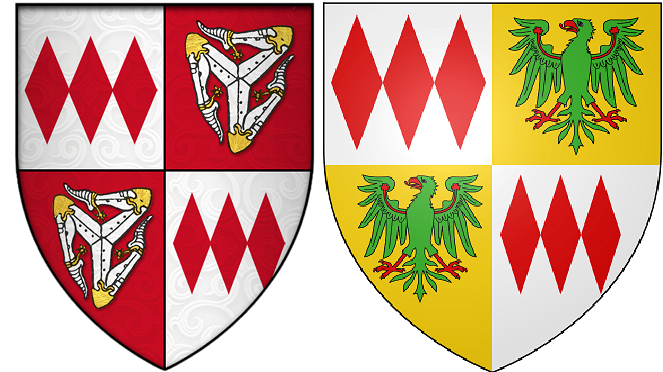 Both knights served in Scotland and were present at Crecy and Poitiers. According to Froissart, Sir Reginald killed Sir Geoffrey de Charny, the bearer of the Oriflamme, at Poitiers. Both are from the BTD Early-HYW range, and picked up when they were 50% discounted. Coincidentally, they are again on 50% sale at the moment. Here is another BTD Late-HYW foot knight; painted up as John Montacute, 3rd Earl of Salisbury. Although not a major participant in the HYW, his uncle, William Montacute, the 2nd Earl of Salisbury, served in most of the campaigns of Edward III. John Montagu was a loyal supporter of Richard II, the son of the Prince of Wales, and successor to Edward III. John Montacute was close to the royal household of England, and at one point was entrusted with the welfare of the future Henry V. Unfortunately he was later beheaded for conspiring to kill Henry IV and restore Richard II. Events which anticipated the War of the Roses. In any case, he'll still be part of the English retinue. A Micron pen was used to draw the eagles - much easier than painting them for me. Some years back I painted up a 120mm Velinden figure in the same coat of arms as they are very interesting and colorful. This figure represents John's eldest son, Thomas the 4th Earl of Salisbury, who fought for Henry V at Agincourt. He met his death at the Siege of Orleans, the result of injuries from cannon fire. Two more BTD foot knights from their Late-HYW line; painted up as Sir Ralph Basset and Sir Hugh Calveley. Both served at Crecy and Poitiers. On the left with the large two-handed sword is the younger Sir Ralph, his father of the same name also served Edward III and fought at Crecy. Sir Hugh is wielding a battle axe and fought in numerous campaigns in France, Flanders and the Iberian Peninsula. He fought along with Sir John Chandos at the Battle of Auray in 1364, and was a leader of the Free Companies. He also took part in the Combat of the Thirty. Again, I am very impressed with these BTD figures. They are nicely detailed, and very robust which will be a plus when used in Lion Rampant skirmish gaming. They are on the larger side of 28mm and are a good match in size and style with the Perry Agincourt to Orleans range. These two are wearing houndskull visored bascinets and mostly-plate armor that would be common from the mid- to late-14th C., and still be seen up to Agincourt. Sir Hugh's coat of arms are: Argent a fess gules between three bulls sable - that is on a white (argent) field, a red (gules) band (fess) between three black (sable) bulls. Sir Ralph's are: Or three piles gules a canton ermine - that is on a yellow/gold (or) field, three red (gules) wedges (piles) with a square (canton) in the upper corner of the field with weasel fur (ermine). Fun with heraldry! Three down, nine more to go for two 6-man foot MAA units for the retinue. Here's the first of the BTD foot knights - painted up as Sir James Audley. He fought at Sluys, Crecy, and most famously at Poitiers. According to Froissart's narrative of the Battle of Poitiers, Sir James was granted permission to fight in the forefront of the battle line. There he was gravely wounded and saved by his loyal squires. After the battle, the Black Prince called Sir James the bravest knight that day and awarded him a pension. As the story goes, Sir James bequethed the Prince's gift to his squires. Upon hearing of this and verifying it with Sir James, the Black Prince rewarded him even more. Sir James went on to become Governor of Aquitaine and Seneschal of Poitou. He died in France in 1369 and was buried at Poitiers. The BTD foot knights were picked up when they discounted at 50%. I'm glad I got them as they are very nicely detailed and sculpted. I ordered a mixture of their Early and Late-HYW figures. They come in 4 figure packs with individual poses and variations in armor. This is one from the Late-HYW set of two-handed weapons. The thigh defenses are actually sculpted as plate, but I painted them up as studded cuisses which were common during the Crecy and Poitiers period. I can't take credit for the post title, but it is appropriate for the last mounted MAA for a Lion Rampant HYW English retinue. The source for the title is a lovely article on the subject by Susan Higgenbotham. The figure is another Front Rank model whose right arm originally held a couched lance. I cut away the lance and replaced it with the hand and sword from a plastic GW Empire swordsman. The linked article above by Miss Higgenbotham details Sir Hugh's short, but eventful life. Suffice to say he served with honor and distinction, unlike his forebears. Here are the three Front Rank figures. L-R below: Duke of Lancaster, Sir Hugh and the Captal de Buch. They are a good match in both sculpting style and size with the BTD figures earlier painted. The Litko horde tray originally held 10 models, but I used a saw to cut it down for the 6 used in Lion Rampant. As the tray was a discount item, and I didn't plan on using it for 10 models, it worked out nicely. Two units of 6 foot MAA each are next. Another one of the Front Rank figures - painted up as Jean de Grailly, the Captal de Buch. Another famous knight during the Hundred Years War, and loyal companion of the Black Prince. Sir Jean commanded the sole English cavalry action during the Battle of Poitiers. Besides fighting his French brethren, he also crusaded in Prussia and participated in the Spanish civil wars. As with the previous Front Rank figure, this horse is also elevated a bit on a thin sheet of plasticard. This give the impression of the horse being the same height as the taller BTD ones. Otherwise, the Front Rank figures, both horse and rider, are very similar in sculpting style and size. In 1372, Sir Jean was captured during a siege by the Welsh knight in French service, Llewelyn ap Gryffud. Having refused the condition of his ransom to never raise arms against France, he was kept in captivity until his death in 1376. Thus passed a knight that Froissart claimed was an ideal of chivalry. This is a Front Rank figure painted up as the Duke of Lancaster. He was a descendant of the famous Edmund Crouchback, whose arms the Duke inherited. Henry was a loyal commander of Edward III and was the victor at the Battle of Auberoche in 1345. Earlier in his martial career he had campaigned in Scotland and also took part in the Battle of Sluys. He was also a founding member of the Order of the Garter. He died in 1360, possibly a victim of the plague. A spare Mirliton helm is used for the groundwork - as I placed the horse a bit further back on the base than I thought. The horse itself sits atop a thin piece of plasticard as the Front Rank horses are a tad shorter than the BTD ones which will be in the same mounted MAA unit. I always wanted to paint up the Duke after seeing the Verlinden 120mm model of him. The sculptor has done a great job in recreating the studded thigh armor - common during the period. The Duke had two daughters - one married the Duke of Bavaria and the other John of Gaunt. Longtime NHMGS member (and former president) Kevin Smyth hosted a great HYW Chevauchée scenario today at the Game Matrix. 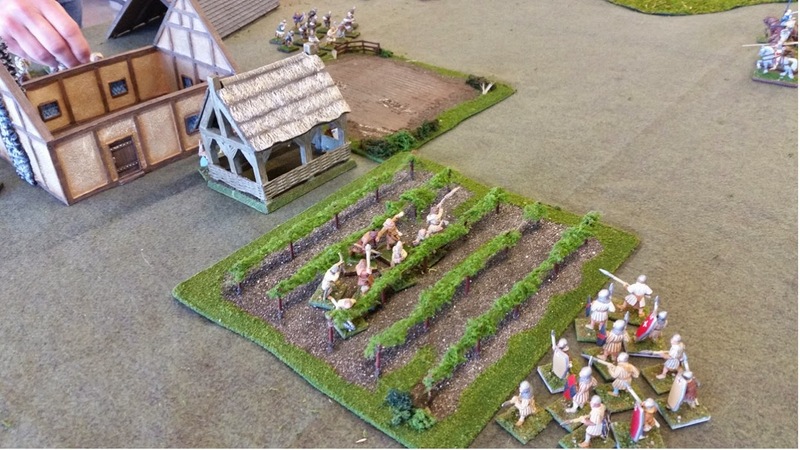 There were 7 players - four French retinues (one made up solely of several Serf units) trying to hold off three English retinues attempting to burn villages (which they mostly did) and storming a rundown castle (which they didn't). All of the terrain and figures are Kevin's. With a keen interest in the period, this is only a fraction of his extensive collection. Kevin has been on the hunt for rules for this period for many years. 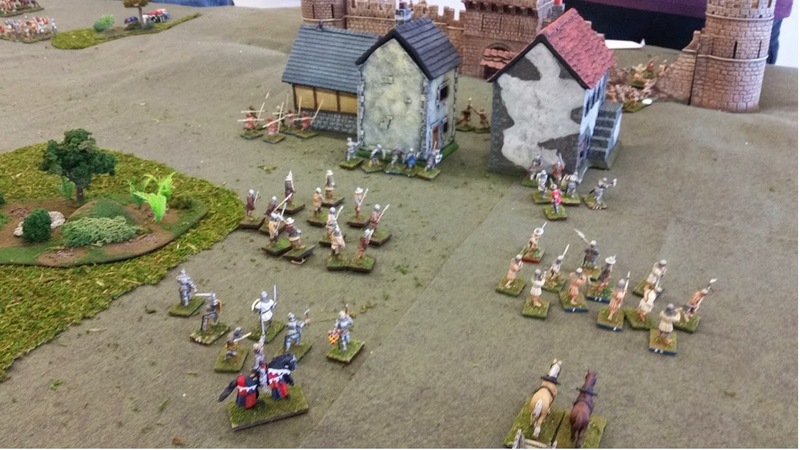 Admittedly, Lion Rampant may not fit larger battles like Crecy, Poitiers and Agincourt, but for raids and smaller engagements the rules work quite well. 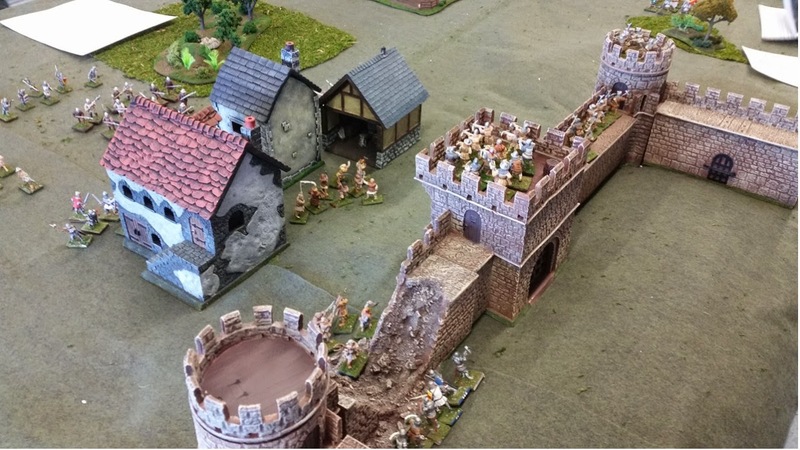 ERRATA: per Kevin's blog post - the actual outcome for the scenario/game was the Serfs winning on Victory Points, followed the French - and the English last - although by appearances, the English burned almost all of the structures less the castle to the ground. They would've accumulated more points if they had looted the villages before putting them to the torch. The dilapidated castle in the center of the table, held by various French troops types, including Serfs. The French retinue on the left flank - which was run by yours truly. There was a unit of Serfs run by my buddy Scott A. which was already inside the village in the distance. The English retinue that moved up into the village burned down the buildings, but could not wipe out the Serfs. English retinue in the center of the battle moving up through a village towards the castle in the back.ground The French right had their mounted MAA destroy the only English unit in the game - a mounted MAA unit. 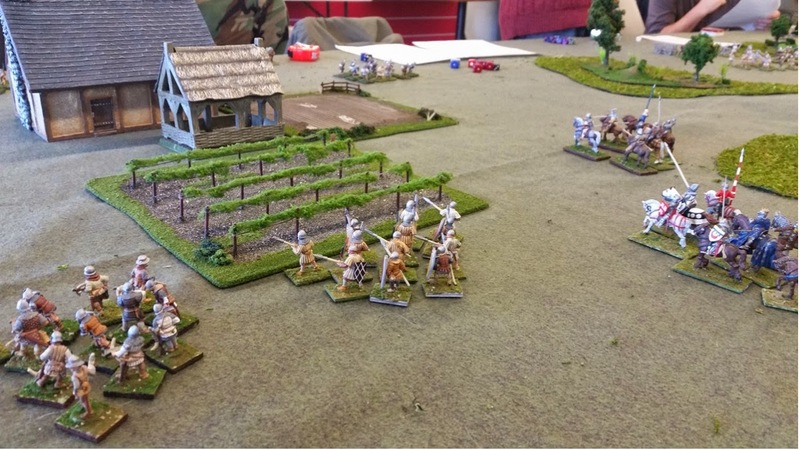 I managed to get the only French unit destroyed - a unit of mounted Serjeants rashly attacking English foot Serjeants.The photo below has the Serfs fleeing through fields. Here's the last of the BTD Early-HYW mounted command figures - painted up as Sir Thomas Holland. He served under Edward III in campaigns in Flanders, Bayonne, and Brittany. He also fought at Crecy in the Prince of Wale's vanguard division. Sir Thomas' arms are: Azure, florettee, and a lion rampant, guardant argent. The flail is another spare Old Glory weapon - with a brass rod used as the staff. Sir Thomas died while serving in Brittany in 1360. He was a founding member of the Order of the Garter. 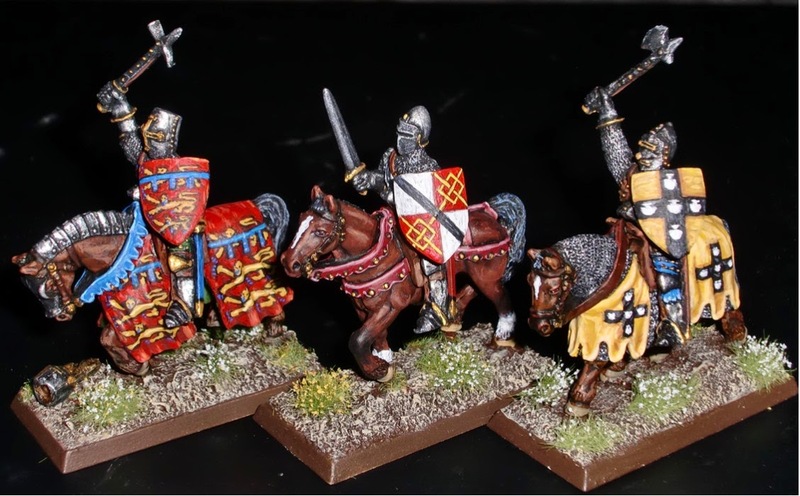 Here are some images of the three BTD knights from their Early-HYW mounted command pack. They'll be joined by some BTD foot knights as well as three Front Rank mounted knights. Although the mounted figures themselves are a good match for other makes, the BTD horses are quite a bit larger than most others. Hopefully they won't be too noticeably larger than the Front Rank ones. These figures will be part of a Lion Rampant English HYW retinue.